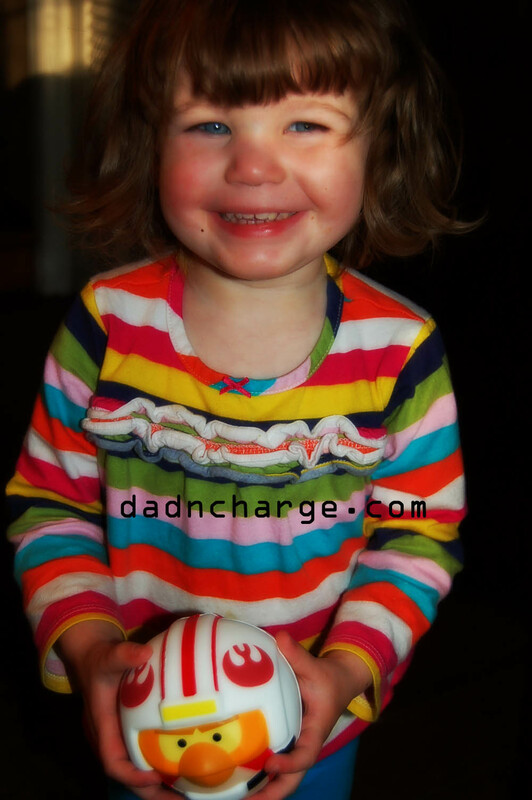 DadNCharge: May The Fourth Be With You! I love Star Wars. I probably love it more than my own son, whom I tried to indoctrinate into the culture when he was only four. Our former residence was near the Strong Museum of Play; we attended Star Wars Day. My son and I even went to an outdoor concert to hear all of John Williams' songs and had a fake light saber fight into the wee hours of the the night (well, for him - it was really only 9pm.) If you ask me when the right time to show your kids Star Wars I can tell you, as soon as possible. In fact, 19 other dad bloggers and I participated in answering this question called the Definitive White Paper on When To Expose Your Kids to Star Wars. When Hasbro then asked me to review their new line of Angry Birds Star Wars toys, I was as excited as Luke Skywalker when he first left Tattoine. Seriously, I was probably more excited than my eight year old son. I have been collecting since I was a kid with my brother and we created our own collection by raiding every garage sale and flea market from Dagobah to Endor. 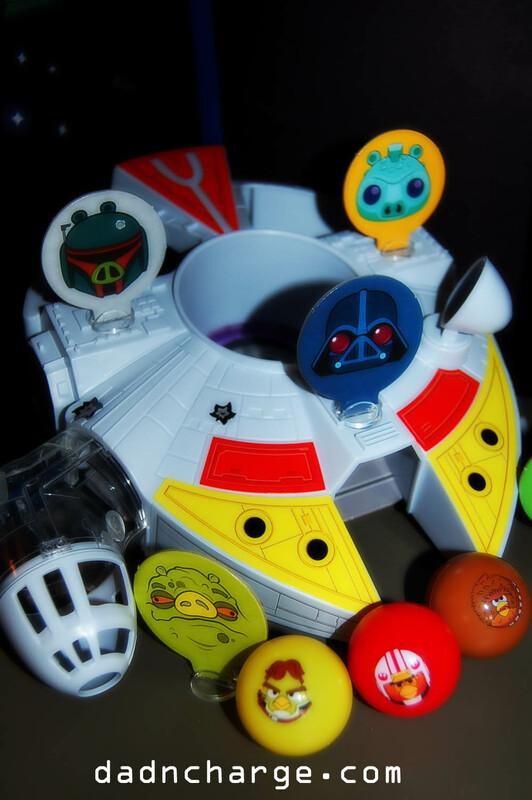 Naturally, I was excited to learn Hasbro decided to take their Angry Birds Star Wars app game into a 3-D game experience. My son loves video games but even those become trite. Now that he is 8, he has been taking an interest in board games more and more, so Star Wars and Angry Birds? That seemed like a huge winner. 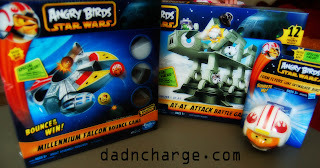 Hasbro sent me an Angry Birds Star Wars AT-AT Attack Battle Game, an Angry Birds Star Wars Millennium Falcon Bounce Game, and an Angry Birds Star Wars Foam Flyer. I used my focus group, my eight year old son, his 7 year old friend, and my 5 year old daughter, to test out the age restrictions for the games which were 5 and up. We tore into the first game Angry Birds Star Wars AT-AT Attack Battle Game, mostly because as a kid, this was one of my prize possessions in the collection. My group couldn't have been more excited, as they plotted their strategy. Stack, launch, and destroy with the AT-AT ATTACK BATTLE GAME, which includes 21 blocks to create the signature AT-AT, a LIGHTSABER LAUNCHER and 12 ANGRY BIRDS STAR WARS figures — including two that are exclusive to this set! Players can also unlock ANGRY BIRDS STAR WARS in-app content with a special code in each pack. We set up the game. This was the hardest part by far. We had it set up on a card table that wasn't quite stable and every little bump sent the pieces crashing to the table. This was a minor hiccup in our excitement as building is half the fun but if games like Don't Break the Ice and other games which take a lot of time to set up irk you, then this game is not for you. The kids seemed unperturbed about this and started to rebuild. I would definitely suggest you play it on a nice sturdy table or the floor which we eventually did to fix stability issues. So, you take the Angry Birds, that they have a hole in the bottom. You place it on the lightsaber launcher, pull back the launcher and let it fly. 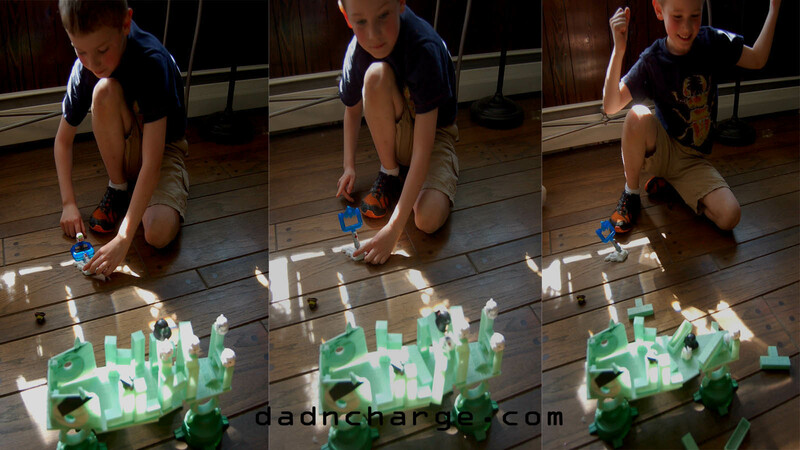 Much like the app, you aim to take out the bad guys perched on top of the blocks. Here is my son's reaction to his first successful shot. My son liked that you were able to build what you wanted. He even said that you could switch roles and have the bad guys go after the good guys. There's just something about Darth Vader Pig isn't there? We didn't like the shakiness of the product but quickly resolved that by using a sturdier playing surface. One thing I did not like was that after it was assembled, there was no case for you to store them in. It would be nice to have a carrying case so that the game could be more portable. I had to put them in Ziploc bags in order for the pieces to not be lost. I was a bit surprised with the retail price that this was not included in the set. 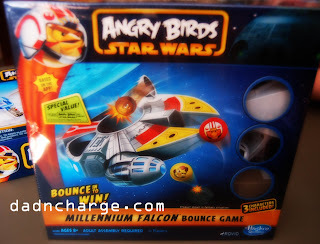 Bounce into action with the new ANGRY BIRDS STAR WARS MILLENNIUM FALCON BOUNCE GAME. Bounce three balls at the MILLENNIUM FALCON to knock down as many enemy pigs as possible, and land in the cockpit to score big! Players can also unlock ANGRY BIRDS STAR WARS in-app content with a special code in each pack. Take the game of PONG and cross with with ANGRY BIRDS STAR WARS and you get this fun hybrid of a game that is sort of like skee-ball. The point is to bounce your good guy ping pong balls onto the table and to either land in one of the openings or knock down bad guy characters. Based on where your ball lands, you receive points for your superior aim and coordination. When we were putting it together, it harkened back to the old STAR WARS sets which I had to construct from plastic, cardboard, and labels. A few annoying things though. The cockpit is the ultimate point system but the ball sometimes gets stuck in the chute and the front of the MILLENIUM FALCON'S cockpit often falls off quite frequently. Also, after it is assembled, it doesn't fit that easily back into the box as is and there are no bags to keep the pieces in. Other than those little details, both of my kids LOVED playing with this game and they got quite competitive. 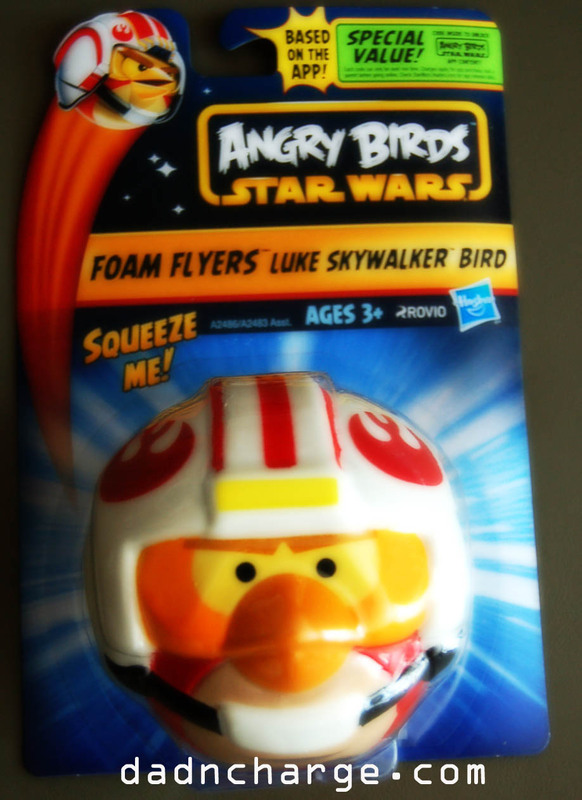 Toss around these 3.5-inch soft foam, iconic characters for a new way to play ANGRY BIRDS STAR WARS! Available in LUKE SKYWALKER, CHEWBACCA, DARTH VADER and STORMTROOPER. Each sold separately. This is my 2 year old daughter. When she saw this ball she said "This for me?" The packaging says 3 and up, so we gave it a whirl. How could I say no to this smile? The foam flyer is a foam ball that is squishy. It was soft enough for her to grip and throw easily. After playing catch with it, I came up with a game we could play. We set up some blocks and placed our own pig on the top of the blocks and tried to knock it down. She loved it! The foam flyers come in all different characters, so if you have a little one, playing this game might be an option for you. Now for the fun part. Let's celebrate May the 4th in style. Want to win your own ANGRY BIRDS STAR WARS® AT-AT ATTACK BATTLE GAME? One lucky reader will! Go to the Rafflecopter widget below and follow the entry specifics. One random winner will be chosen. Retail Value $39.99. Available now in stores nationwide. Legal Stuff: Promotion open to U.S. residents ages 18+, void where prohibited. Winner will be chosen at random on May 2, 2013, and will be notified via email to obtain their shipping address. If no response within 24 hours, an alternate winner will be chosen. Shipping address must be a street address - no P.O. Boxes, must reside in the U.S. Prize provided by Hasbro Gaming and delivered by Hunter PR. Not responsible for lost or misdirected mail. FTC Disclaimer: This is a sponsored post on behalf of Hasbro. This company has supported my imagination through play for many years and continues to do so. The material posted here are solely Chris Bernholdt's opinions and what I have observed by three very excited children. 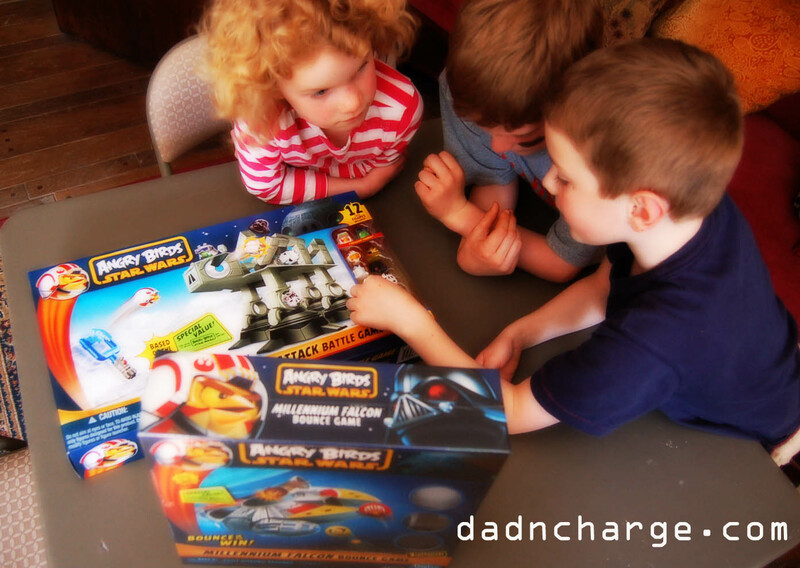 Thank you Hasbro for giving DadNCharge the opportunity to share your wonderful products. I had the same issue with the cockpit falling off a lot. Maybe that is something they need to look into.